This post is an idea rather than a complete recipe. I have often bemoaned that haggis (even the vegetarian version I make a few times a year) is quite boring in presentation. I have tried many ways of presenting haggis. Some more successful than others. 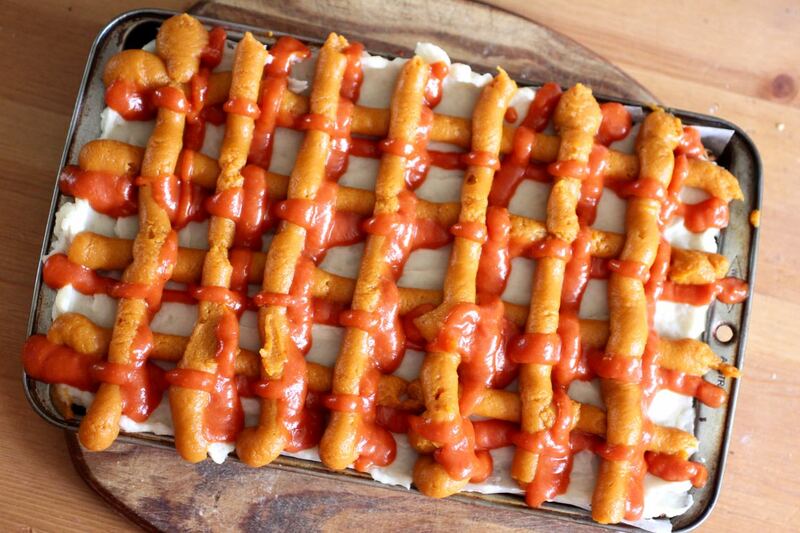 A month or two ago it struck me that I should pipe the neeps and tatties to make a tartan topping. I tried it for St Andrews Day (today). It was not perfect but had potential. As I suspected it took me quite some time, about 2 and and half hours, with a lot of meandering as I cooked it yesterday. Fortunately we had a quiet weekend to regroup and try and sort out the hurricane of a house. But I did get a little distracted by The Gruffalo on the telly. Such a gorgeous telemovie. 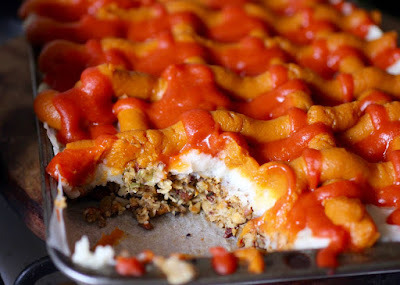 I made four components: my usual vegetarian (vegan) haggis (colourful with a few green beans and some red pepper added); mashed potatoes (mashet tatties); baked, peeled and pureed sweet potato (in lieu of any bashet neeps); and tomato sauce (because we didn't have enough bottled stuff). The haggis and mashed potato were great. I had imagined piping thick lines of neeps but I only had sweet potato. It was quite thick because I baked them and only added a little butter and seasoning to the mixture before pureeing with a hand held blender. It made lines like thick pipes across the potato. I think that sweet potato is thicker than neeps or turnips but I am not sure that the thick piping nozzle was the right one. I had intended to use bottled tomato sauce but didn't have much. So I made up a sauce by frying onions and garlic, then adding a 750ml jar of passata, 1/4 cup tomato paste and mustard, maple syrup, salt and cinnamon. 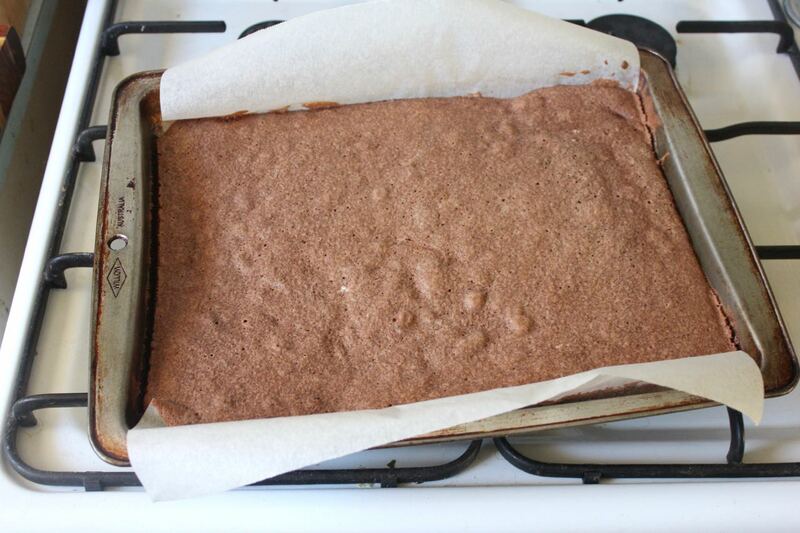 It was so thin that I used 1/4 cup of cornflour but it was still too thin. In an ideal world I would have had more time to reduce it. And finding the right consistency is not easy. However I want to try again and I think next time I might spread the mashed potato on, then a layer of neeps, then some thin piping of potato and a thicker tomato sauce, with the lines spaced out a bit more. If I was better with piping I would be tempted to try it with ramekins so it was served up neatly rather than landing on the plate in a pile. Sadly my piping skills are in need of more practice. However I am surprised I could not find any pictures from some enterprising restaurant making it this way. Most importantly, it was absolutely delicious. In fact I really loved having the sweet potato and tomato sauce with the haggis and potatoes. Sylvia screamed at being asked to eat a mouthful while E and I went for seconds. We ate the leftovers tonight. Next time I will use a ceramic dish because I don't like leaving dinner overnight in a metal tin (it was my slice tin) and it was very messy to move it to another dish. Dinner tonight was quite a scramble of the haggis, sweets and tatties (if I can get away with called sweet potato "sweets"). But E refrained from his favourite saying of "Inverness, what a mess" as it was also very yummy. At the last moment I secured a place at Maha last week for their No Bull All Vegan Affair Degustation. Maha, in Melbourne CBD, has been highly praised by many for its fine Middle Eastern food, including the vegan/vegetarian menu. I had high expectations of the 5 course meal ($99) and was still pleasantly surprised by much of the food. 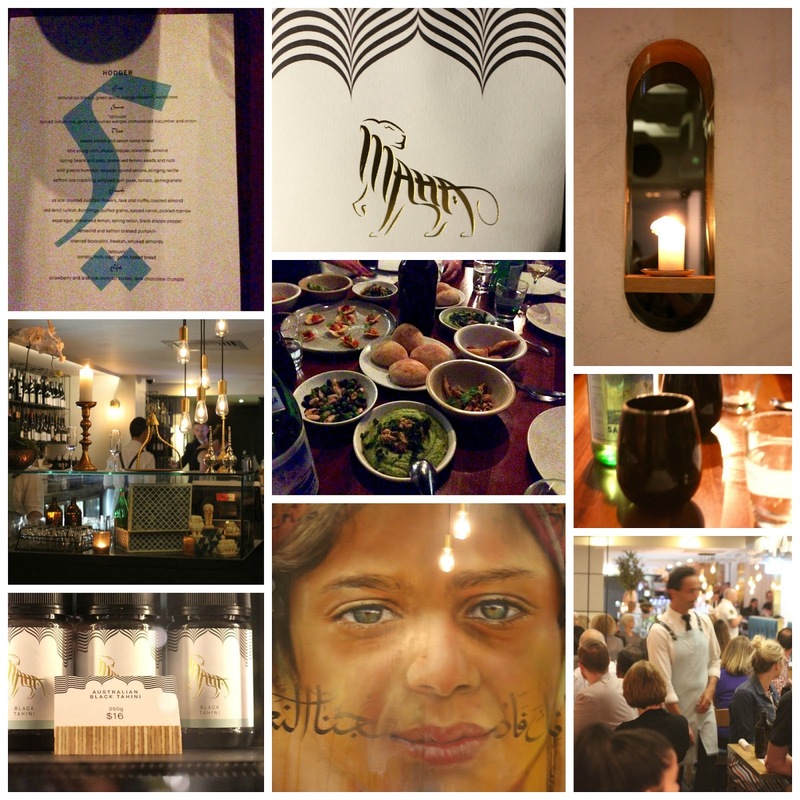 Maha is tucked in a little laneway with an unassuming entrance. Stairs lead underground to a large dining room with elegantly simple decor. We sat on a communal table in a dark corner. The dim lighting was not conducive to good photography and is reflected in the quality of my photos. I also found it difficult to read the tiny print on the menu and was grateful to my neighbour for reading it to me (thanks Angie). We were greeted with a cocktail or a mocktail option. I chose the latter. My non-alcoholic Mint and Apple Crusta comprised apple juice, green tea, cinnamon sugar, lime juice, sugar syrup and mint bitters. It was served in a black tumbler with a sugar crusted rim. I found it refreshing with a pleasing hint of warmth from the cinnamon. I usually avoid spices in cool drinks but this was amazing. 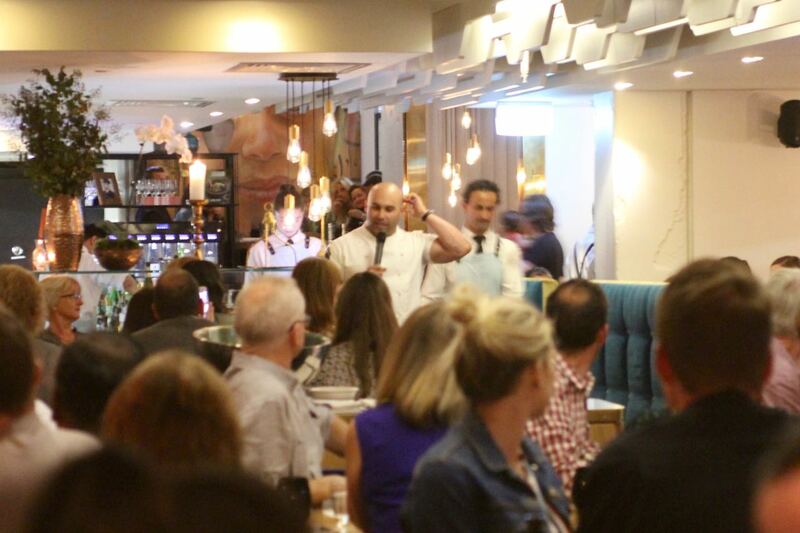 Before we ate, Shane Delia, the head chef addressed the room to welcome us. He spoke of how chefs who had once groaned upon hearing they had a vegan guest, were now relishing the creativity and opportunities of making plant based dishes. He talked about how they find it easier to make good vegan food and add in to make it vegetarian rather than take away to make it vegan. At the end of the meal, I was not feeling it needed anything added to it. I wondered about the guests at this vegan dinner. There were plenty. I think I was the only non-vegan on our table. But as a vegetarian who loves vegan food, I would like to think there were more omnivores and vegetarians who feel the same way. But onto the food. First course was almond ajo bianco, green apple, orange blossom, watercress. 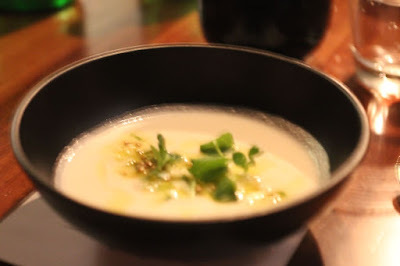 It was a lovely light creamy soup that Rosalie commented was like a yoghurt soup. I really loved the chunks of apple, (coriander?) seeds and fresh leaves on top. It was a perfect way to start a meal. The second course appealed less to me. 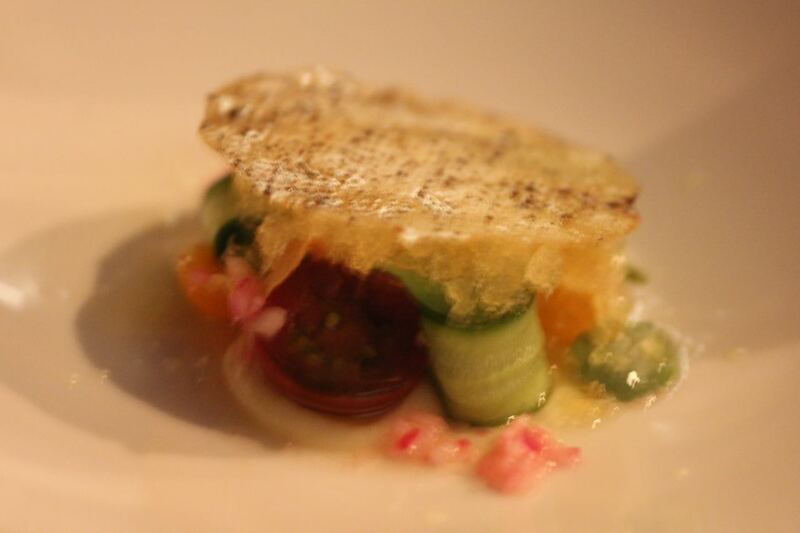 It was a deconstructed 'Fattoush' with spiced tomato ice, garlic and sumac warqaa, compressed cucumber and onion. Apparently the warqaa was the thin crisp on top (an online search found a warqa compared to filo pastry). I assume the compression was the silky puree at the bottom. I liked the warqaa but tomato and cucumber are vegetables that I disliked as a child and some days they still don't work for me. Others really loved this dish so obviously it depends on your preferences. The next two courses were an overwhelming spread of tasting dishes. Third course was five dishes. Sweet potato and seven spice briwat. I could have eaten many more of these tasty little triangular pastries but we only had one per person. BBQ young corn, aleppo pepper, coriander, almond. This has to be the greatest surprise of the night. I was delighted at how delicious the seasoning on the corn was and wished for more but it went quickly. Saffron rice crackling, whipped split peas, tomato, pomegranate. In the above photo they are top left of the bread rolls but they were so beautiful I wish I had a better photo. I had a tiny mouthful in mine and wanted the plateful. They were the most amazing dish of the evening. Pork crackling was a treat when I was young and these crunchy (fried?) 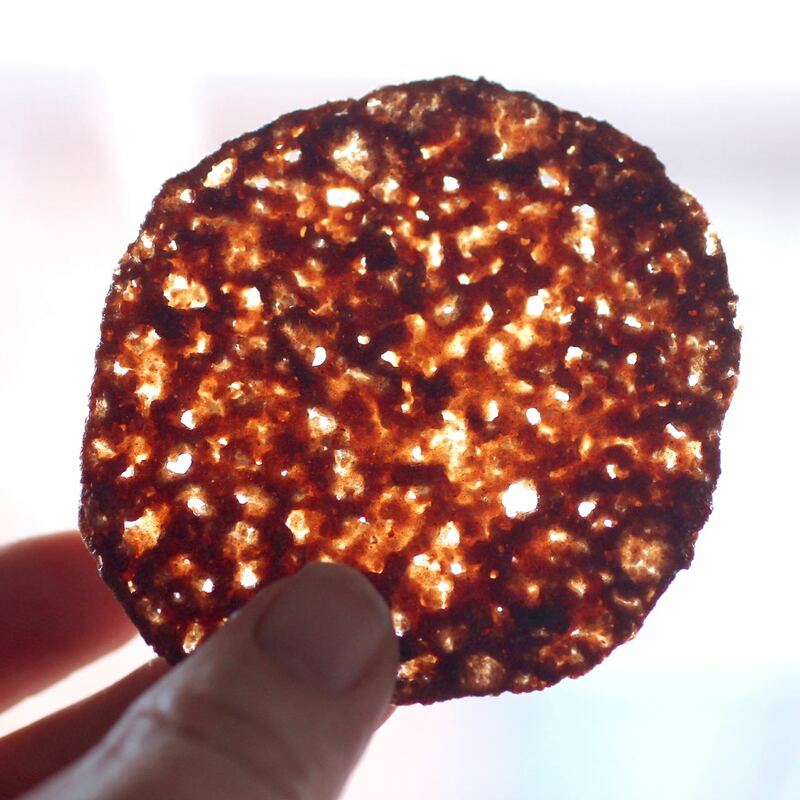 rice crackling discs were the closest I have ever had since becoming vegetarian. The whipped split peas were a revelation that split peas don't need to be dense and heavy. And the tomato and pomegranate were just so prettily presented on the crackling. Spring beans and peas, preserved lemon, seeds and nuts. 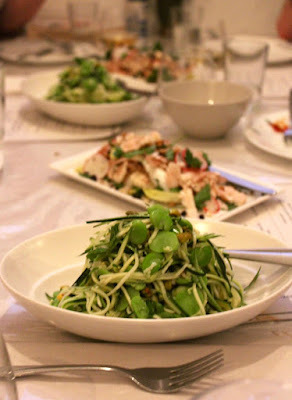 I enjoyed this dish for being full of fresh vegies but did not love it enough to have seconds. Possibly I was just disappointed not to be able to have seconds of the first three dishes. Wild greens hummus, caraway spiced onions, stinging nettle. This was served with really lovely soft bread rolls (ciabatta?). I really enjoyed this but because we eat a lot of dip and bread at home it didn't take me outside my comfort zone in the way other dishes did and I felt we were served a large bread roll and lots of dip while the first three dishes in the course were so unusual and amazing but served in such small amounts. It is a quibble as I loved all the food in the third course and I suspect the other dishes were more time consuming to make. And I did have seconds of the dip because I loved it. 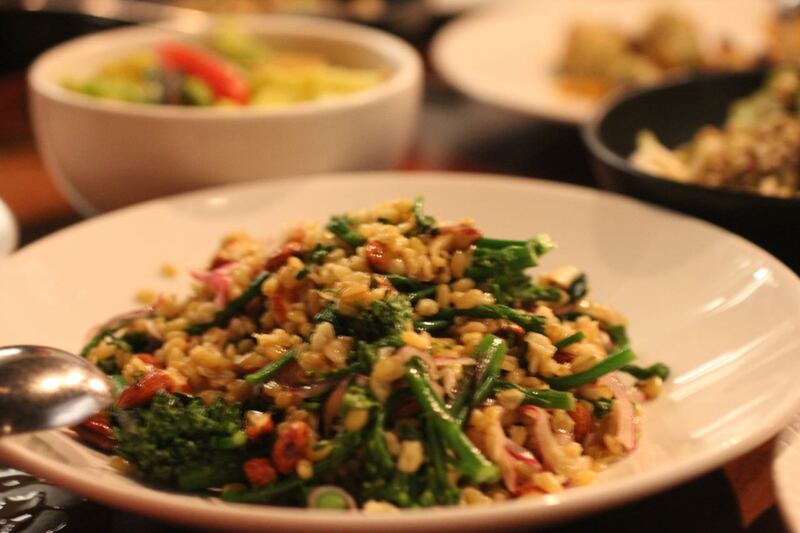 Charred broccolini, freekah, smoked almonds. This was just so good that I was very happy to be able to have seconds. Unlike most dishes this was substantial enough to be a meal in itself. I loved the grains and greens finished off by smoked almonds. One of my favourites. Tamarind and saffron braised pumpkin. Fortunately I love pumpkin or I would not have felt so favourable towards this soft, eye-watering spiced pumpkin with its halo of crispy breadcrumbs. ‘Fattoush’: tomato, mint, roast garlic, baked bread. Due to personal preferences, I was less than wowed by the lettuce and tomato combination here. There just wasn't enough bread in my serving to balance it. However others told me how amazing this dish was. Asparagus, preserved lemon, spring onion, black aleppo pepper. How I love freshly cooked asparagus and this was beautifully cooked with a lovely seasoning. 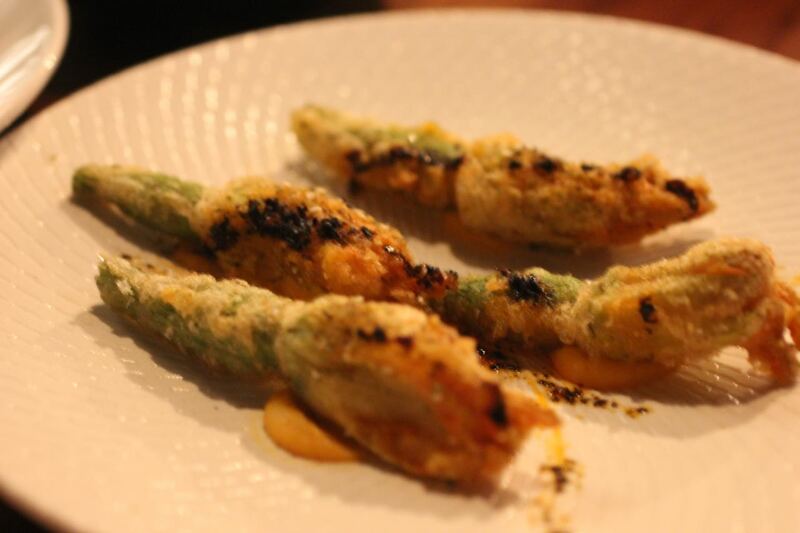 Zaatar crusted zucchini flowers, fava and truffle, toasted almond. I really loved the light and crisp coating and the soft truffled fava puree stuffing. A favourite dish. Red lentil Turkish dumplings, puffed grains, spiced carrot, pickled marrow. This was among the revelations of the evening. It was so hard to keep up with the dishes that I thought this was a dish of vegetables and then found that it had mini dumplings filled with red lentils and they were so so so delicious that I just wanted to eat them for the rest of the night. (I enjoyed them even more for Faye's discussion of her grandmother's dumplings.) The sauce on them was really good too. Dessert was our fifth and last course. 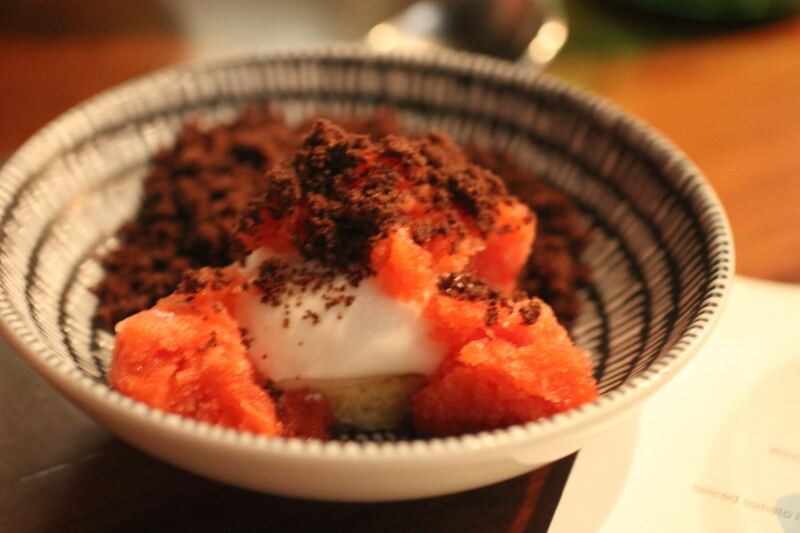 We were served strawberry and arak ice, coconut sorbet, dark chocolate crumble. I am not a big ice cream fan but I now think all ice cream would be immensely improved with chocolate crumble. Think really good quality chocolate biscuits ground up. The strawberry ice went really well with it and didn't taste too strongly of the alcoholic arak for me. While I would have loved some of the doughnuts I have seen others post about, I was very happy with this refreshing dessert with a hint of decadence in the chocolate crumble. 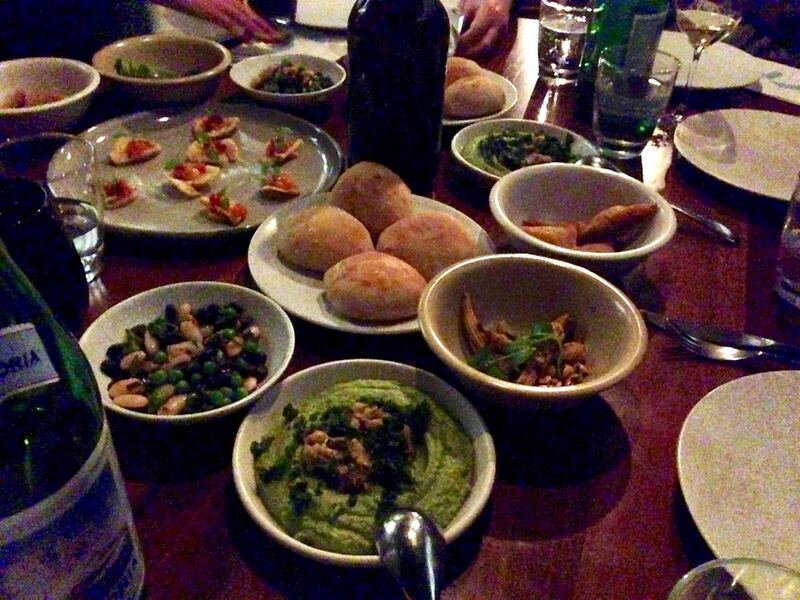 It was a pleasure to be able to be able to sample the "meat free madness" at Maha. I really enjoyed the company and the food and before we knew it, we were taking some last photos and heading back up the stairs into the night. 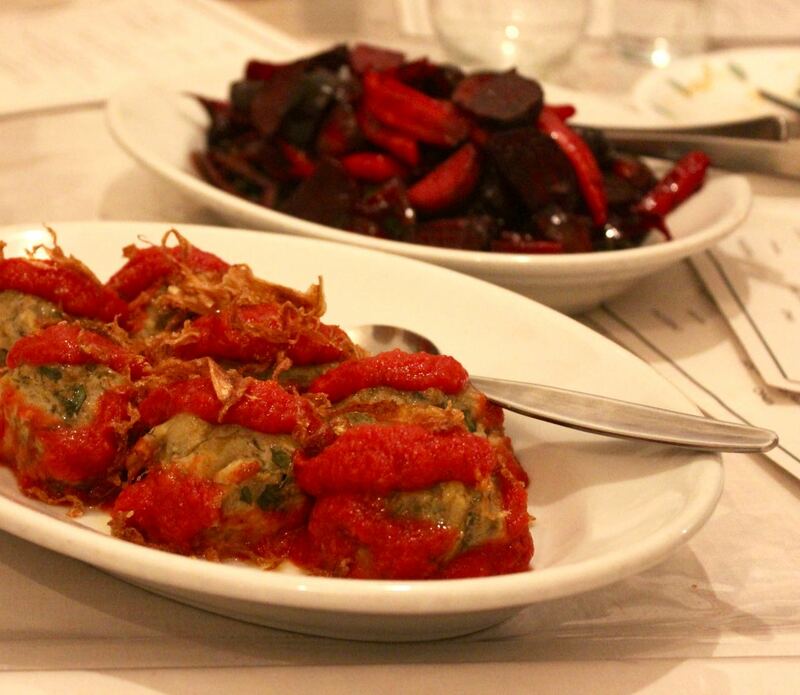 I would love to return and try the regular vegan/vegetarian menu next time I am planning a special meal in the city. You can read more about the meal on Veganopoulous and see Faye's lovely photos. It took me a long time to understand Thanksgiving. Until I started blogging, I thought it was just like our Christmas. Now I know it is at a different time of year, celebrating the harvest rather than religion, and the food is different. While there is turkey like my childhood Christmases, the side dishes and dessert are totally different. And the stuffing is cooked with chunks of bread, not breadcrumbs and it is not cooked in the bird. Which makes it more attractive for a vegetarian. I finally tried an American-style stuffing recipe. It has sat in my drafts for too long. I promised myself I would post it in time for Thanksgiving and now suddenly Thanksgiving is here. So here it is. I had been working up to making stuffing for a while now. One of the great appeals of stuffing is that it is an opportunity to use up all those dried ends of sourdough loaves in the freezer. 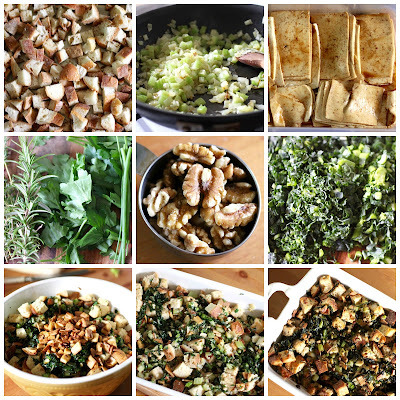 I have been bookmarking stuffing recipes with interesting add-ins for a while. Chestnuts, cornbread, apples, dried cranberries and nuts of all kinds. It seems that I am not alone in getting more familiar with Thanksgiving. I recently saw a Thanksgiving recipe in a local supermarket magazine. 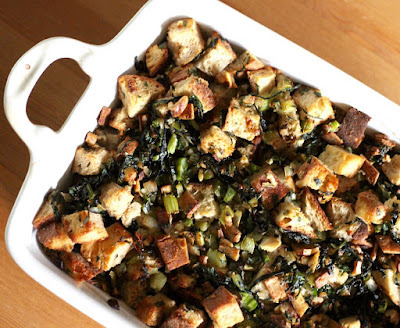 This cornbread stuffing with kale, bacon and pecans had the sort of flavours I liked. I also sort of followed a Vegetarian Times recipe which said I should tip in the stock and the bread should soak it up. Mine did not soak up. I don't know if there was too much stock or that my bread was too stale and too many crusts. The day that I baked this stuffing was a busy one so I made dinner ahead of time. It looked great when it came out but was a bit wet for me. I am confused about if this was in the moist or the soggy category. It was nice but I have never had this sort of stuffing before and am still not sure how it is meant to taste. When I reheated it the next night I put it under the grill (broiler) to crisp up and served it with vegies which I preferred. 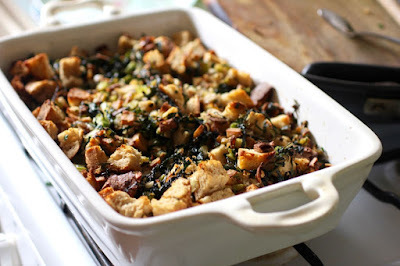 Possibly my main problem with the stuffing is that it is more like a bread pudding than the stuffing I grew up with. I loved my mum's stuffing because, let's face it, it was better than the meat. Always. 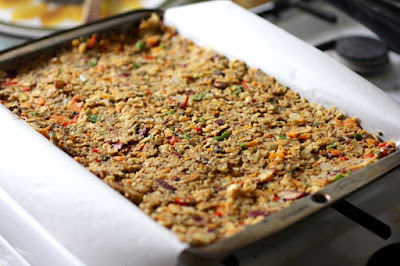 So I would prefer a nut roast to this stuffing because nut roasts traditionally use breadcrumbs rather than bread chunks which is far more like my mum's stuffing. 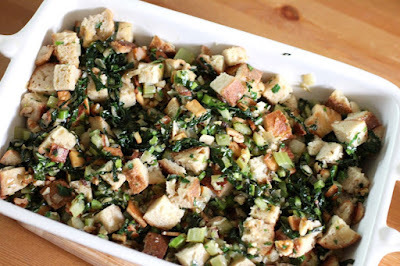 However I am willing to concede that if surrounded by lots of great side dishes and cooked as it should be (if I got it wrong) than I could love this stuffing. And I am sure it would work on a Christmas dinner table as much as on a Thanksgiving spread. But I know that stuffing is far more of a tradition in some American houses. So to those who are celebrating Thanksgiving, I hope your stuffing is moist but not soggy (apparently that is right) and that you enjoy good food with good company. I am sending this to Kimmy for Healthy Vegan Fridays, Jacqueline for Meatless Mondays and Shaheen for Eat Your Greens. 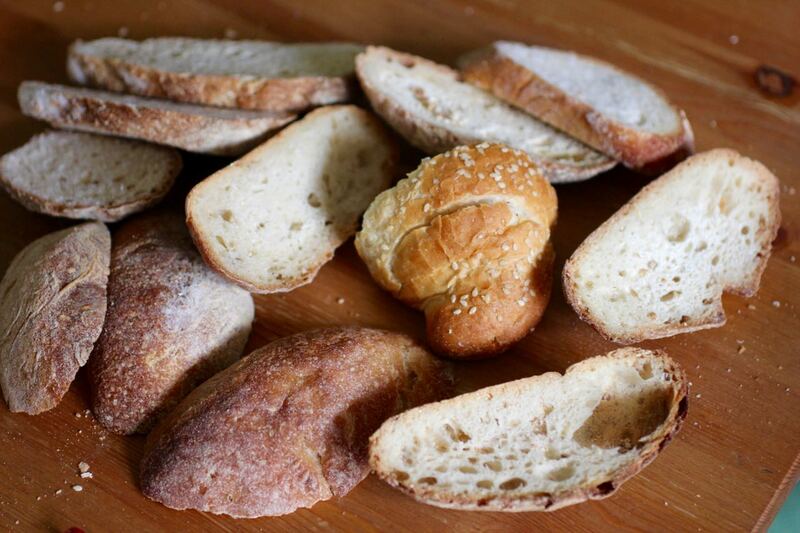 Place bread cubes on a large oven tray and bake at 180 C for about 8-10 minutes until dried out. (Mine took a little longer possibly because it came straight out of the freezer.) Place the chopped walnuts on the oven tray for about 5 minutes or until toasted. Fray tofu bacon on the stovetop in about 1-3 tsp neutral oil until crisp.Set aside. 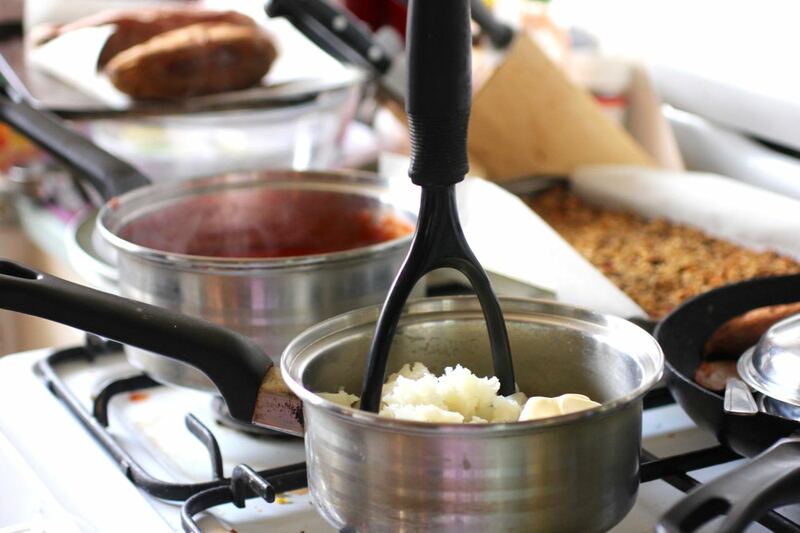 Heat olive oil or butter in large frypan and fry onion, celery and garlic for about 10-15 minutes or until soft. Add kale and fry another 10-15 minutes. or until kale is wilted and a little crisp around the edges. Stir in the herbs for 1 minutes. Mix bread, walnuts, tofu bacon and vegetables with stock in a large bowl until stock soaks in (but mine didn't so perhaps less would be better). Check and adjust seasoning. 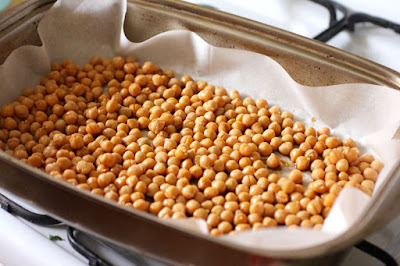 Tip into a large oven tray and bake for 40-60 minutes or until crisp on top. Yesterday Sylvia told me that when I use chickpeas, I must not tip the water off them down the sink because it is a waste. When the 6 year old in the house understands the value of aquafaba, it is a sign I have been experimenting with it quite a lot lately. 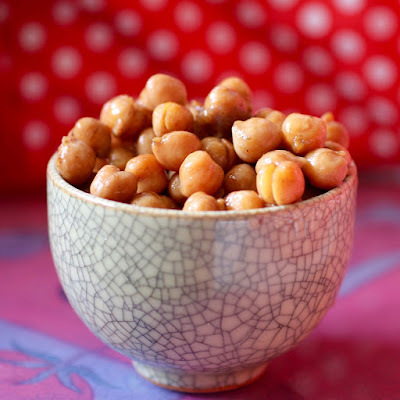 Indeed I had high hopes of making Nigella's "macaroons" for a celebrity chef picnic on the weekend but the tamari chickpeas from Dreena Burton were actually far more successful. Firstly let me say that I am far more comfortable with macaroons (which remind me of my grandfather) than macrons (which seem fiddly and trendy). So I liked the idea of veganising the macaroons in How to Be a Domestic Goddess for a vegan picnic. The more I looked the more they seemed like macrons. 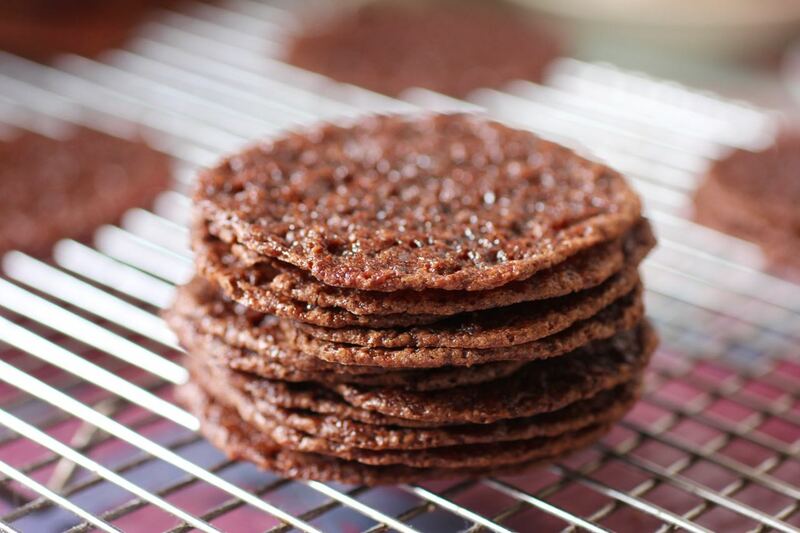 Having never made this sort of recipe before vegan or not, I decided to trial them the previous day because I was going to a family meal in Geelong. They flopped. I wondered if they were affected by using almonds rather than pistachios or if the almond meal was not fine enough. However I suspect the main problem was rushing around trying to get ready to make pancakes and getting Sylvia ready for gymnastics while having an oven timer that is being unreliable. You can see in the above photo that they had potential. They tasted good but were not worth sandwiching together with passionfruit frosting as I had planned. I had found that they baked too quickly in the first (vanilla) batch. My oven needs baking to be turned midway through but I had got too distracted to turn them in time. When I turned the chocolate macaroons midway, they did not look promising. They came out so flat that I almost curled them like brandy snaps. So much for doing my trial run. The second batch were far worse than the first. I almost threw out the remaining mixture and then decided to bake it anyway and just embrace the crisp flat macaroons. 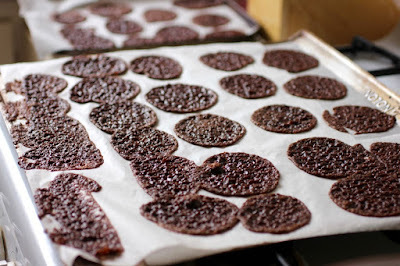 There was still some skill to bake them long enough that they weren't so sticky in the middle that they were impossible to get off the paper, and not bake them so long that they were going to break a tooth. When I left some in a tub for E who was not at the picnic, he looked at the shards and asked if I was going to bring home proper chocolate biscuits from the picnic. Poor man is used to always being given the worst of the batch and expected there must be better versions somewhere. As it was he decided they were too sweet. As I had quite a lot of chickpeas leftover after using the chickpea brine for aquafaba, and not a lot of energy for anything else, I made Dreena's Tamari Chickpeas. They were a really nice snack and great to for lunches today. And because it seemed mean-spirited to take a failed dessert and a simple baked chickpeas, and because I had left my sourdough starter out overnight by mistake, and because I had pizza sauce in the freezer and love making vegan mozzarella, I made a pizza to take along. It was very relaxing to sit in the Edinburgh Gardens with good food and good company. And there were so many delicious desserts that I didn't really mind that my attempt to mix Nigella and aquafaba had failed. Yet more experiments will follow. You can read more about the picnic from fellow bloggers Faye at Veganopoulous and Where's the Beef. Preheat oven to 200 C and line a large roasting tin with baking paper. Mix all ingredients in the tin and bake for about 25 minutes, stirring once or twice. They will still be soft and tender rather than crunchy. Eat hot or room temperature. Can be kept in container in the fridge for a 2 to 3 days. Preheat oven to180 C. Line two large baking trays with baking paper. Sift the icing sugar and cocoa. Set aside and have almond meal and castor weighed and ready. Beat aquafaba for about 2-3 minutes until white and fluffy. 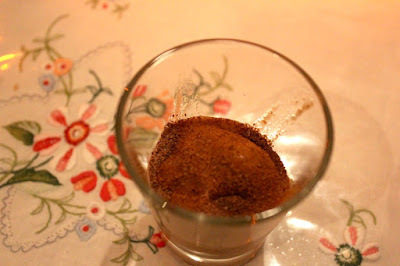 Sprinkle castor sugar over the mixture and continue beating for 3-5 minutes until stiff peaks but not dry. 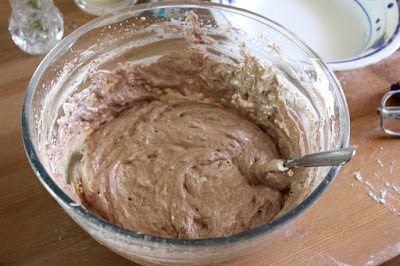 Very gently, using a metal spoon, fold in icing sugar, cocoa and almond meal. Pipe mixture into 5cm diameter rounds on baking paper leaving 5-10 cm space between each circle of mixture. 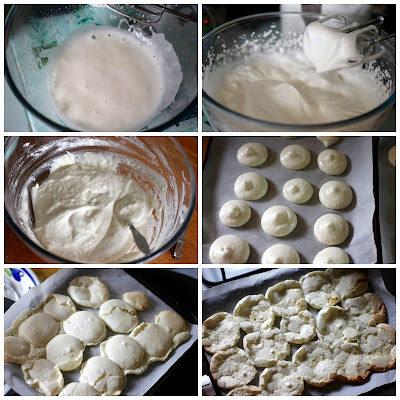 Bake for 10-12 minutes until bubbly and slightly dried. Cool on baking paper for 10-15 minutes and then gently peel off and keep in an airtight container for a few days. NOTES: This is what I did. I thought it might make macarons but even when I left them to sit for 15 minutes they just were flat. Perhaps another time I will try and see if I can get them to rise. 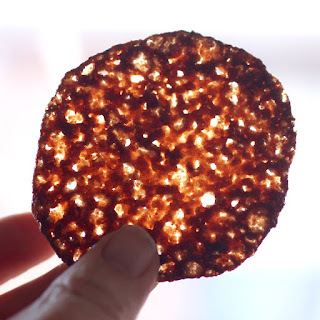 Meanwhile, they have some merit as crisp chocolate lacy rounds. 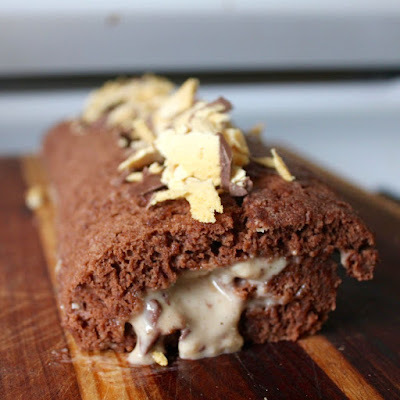 Those of you who are familiar with swiss rolls might guess from this top photo that it was not a complete success. For if it was I would probably have a lovely photo of a perfect swirl of cake and cream or frosting. However it was my first swiss roll, and was made almost vegan with aqua faba. This is quite a feat and has lots of learning that I wanted to record and share. I also wanted to record my journey into sponge making for another reason. In my childhood, my mother and grandmothers regularly produced magnificent sponge cakes and pavlovas that relied on lots of eggs. I ate them but I never liked eggy foods and hence have never made them as an adult. So I have embraced the discovery of the egg-like properties of aqua faba. It is returning me to my baking heritage in an unconventional way. I sometimes feel guilty that I don't make pavs and sponges with Sylvia the way my mum did with me. 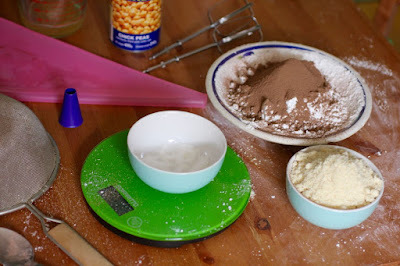 Which might explain why, instead of her doing some ukulele practice or reading after school, I showed her how to sift flour and fold flour into the whipped aqua faba and sugar. It is hard to believe that for all the baking I do that I don't think Sylvia has seen me sift flour before. It doesn't happen often but I know it is important for sponge cakes. I didn't let her have a go at folding the flour in. Not yet. That is delicate work especially when working with unfamiliar recipes. I have meant to try a swiss roll forever but it is something that intimidates me. Too much that can go wrong. Yet they look so pretty. And my dad loves them. When Choclette called for chocolate and banana creations for We Should Cocoa I wanted to make something special. I gave it a lot of thought and my whacky idea was to make a savoury mole flavoured swiss roll with a chilli, lime and banana filling. I wasn't not quite brave enough. So I fell back on a sweet version I had found. 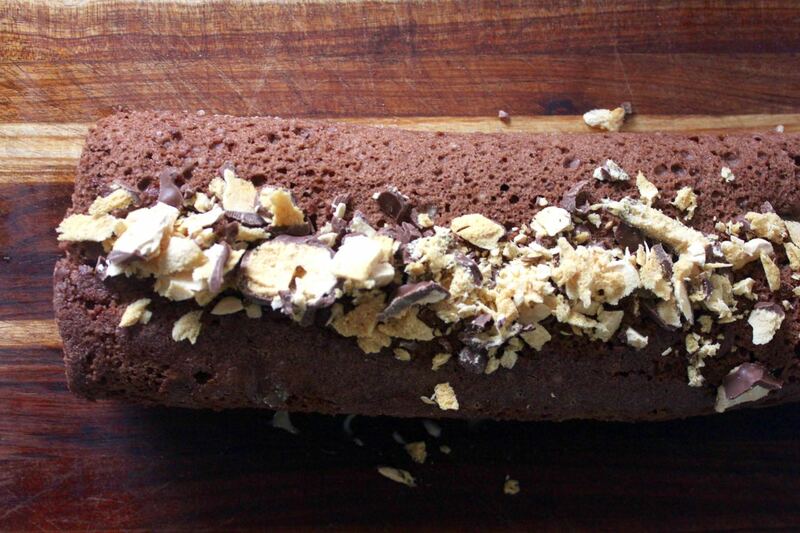 A chocolate honeycomb and banana roll. Only I decided to make it vegan. Well almost. I used violet crumble to mix into the filling and arrange on top, as the original recipe did. It was a sentimental choice because my dad loved them. Up to the moment when I rolled up the cake in the baking paper, I was pretty happy with my progress. Then I tried making vegan marscapone because the original recipe called for marscapone. It was really runny and I have only rarely used dairy marscapone and wasn't sure how it should be or how to thicken it. Custard powder didn't really work. The banana and violet crumble helped a little. Even worse, when I tried to unroll it while still warm, the cake cracked. This was not good considering that I had a really runny filling. I am still undecided on what would have worked best in the filling. The original recipe had caramel spread over the cake before adding the marscapone. I liked the idea but didn't have time or energy to make it. 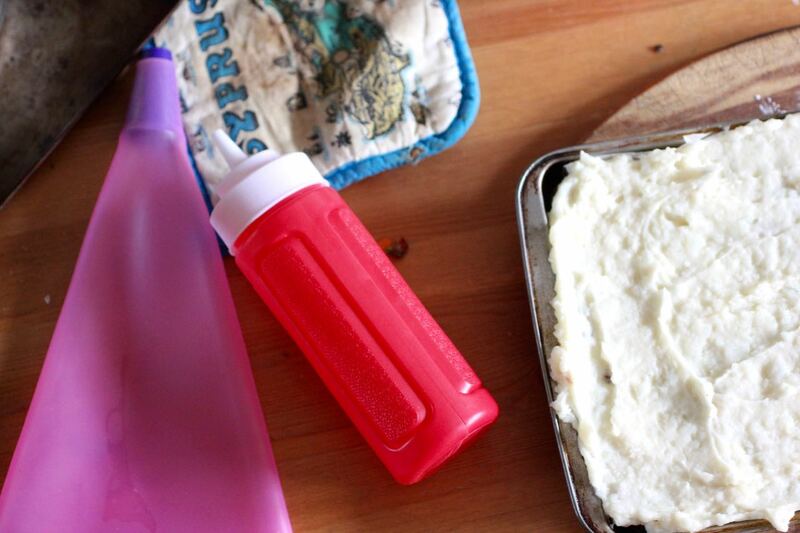 Frosting might work and I had my eye on this banana frosting. However I think it would have needed to cool completely for frosting. And I wondered if the cake would have cracked more if it was cool. 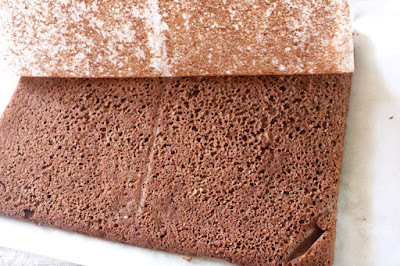 I also found this article from Kitchen Tigress about how cocoa makes it hard to work with a swiss roll. But everything is better with chocolate. 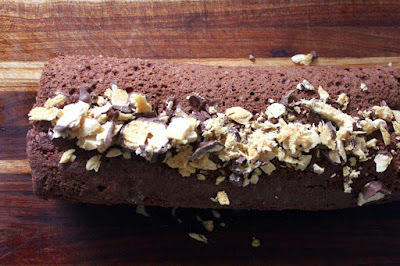 I also liked the chocolate coating on Vegan Dad's swiss roll to cover up imperfections. I really need more practice and hope to do so. When and if I do, I will post more. 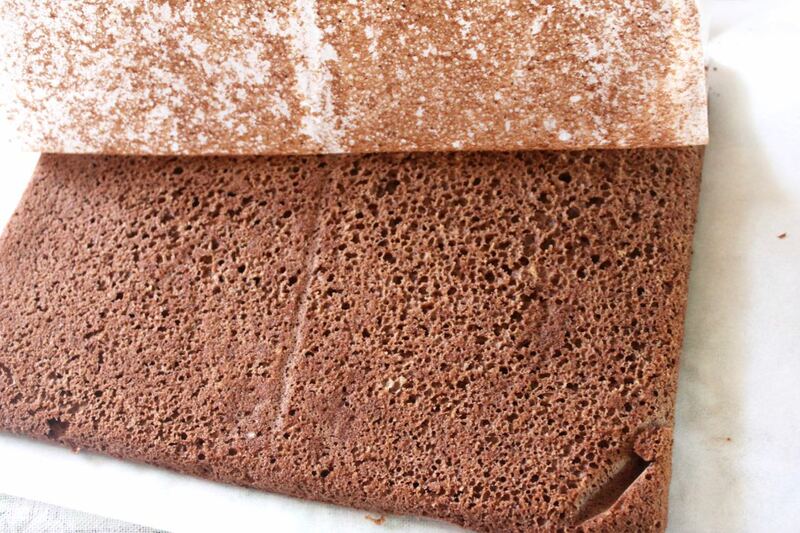 Preheat oven to 200 C. Grease and line a swiss roll tin (about 9 x 13 inch rectangular tin). 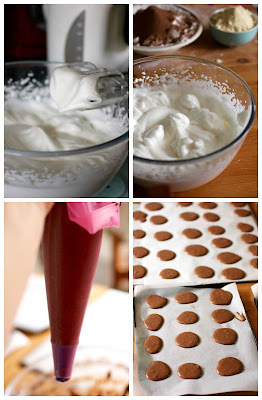 Or if you want to be traditional, grease and line with flour. Make sponge cake. Sift dry ingredients. Beat aqua faba until bubbly. Add sugar and beat for 5-10 minutes until soft peaks. Beat in vanilla. 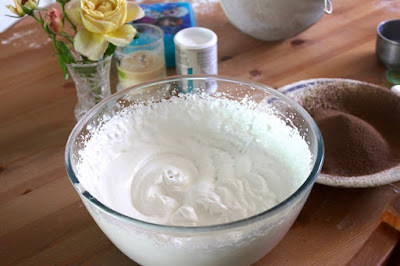 Gently fold in sifted dry ingredients. Make marscapone filling by blending coconut milk, cashews, lemon juice, brown sugar and custard powder. Pour into a small mixing bowl and mix in roughly mashed bananas and 1 bar of chocolate. After the cake has been rolled up about 30 minutes, carefully unwrap and spread the filling in the middle. (Mine was quite runny and I am still unsure of the best filling.) It was best served after the roll had sat in the fridge for at least a few hours. Can be made a day in advance. NOTES: This could be converted to plain vanilla cake by substituting flour for the cocoa. I didn't soak the cashews because I have a high powered blender but if you are using a regular blender, I recommend soaking them at least 2 hours. I used violet crumble - a chocolate covered honeycomb bar - but it is isn't recommended for strict vegetarian or vegan diets. Any chocolate bar would do - either a filled one or a bar of dark chocolate. I arrived at Bar Idda's vegan degustation feeling flustered from desperately seeking parking. Upon entering, I was greeted with the lively bustle of the full restaurant. It didn't take me long to relax with the the friendly folk on my table and an attentive waiter. And then the seven courses started coming our way and I had a lovely time. So much delicious, fresh, interesting food. 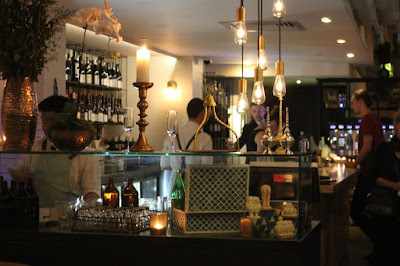 Bar Idda is an Italian restaurant in Lygon Street, East Brunswick that focuses on the fresh flavours of the Sicilian cuisine. It is in the building that used to house Rumi before it moved down the road. 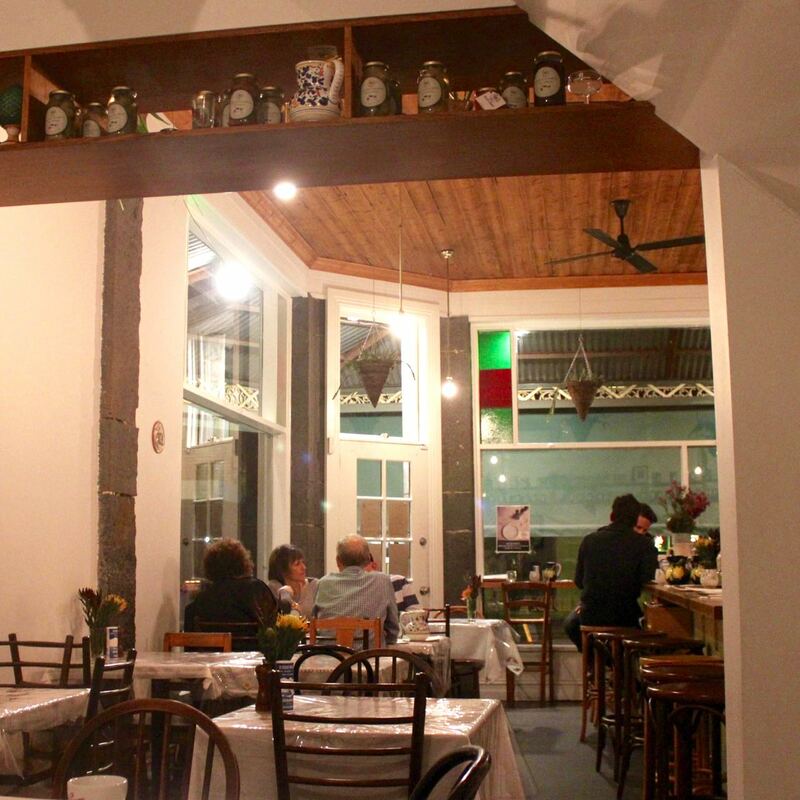 It has a rustic ambiance with the embroidered white table cloths, mismatched wooden chairs and white stucco walls. I was there for the Roots Fruits and Wild Herbs seven course vegan degustation, which was held as part of The Age Good Food Month. The service was friendly and enthusiastic. Our waiter announced each dish and was happy to discuss what was in them. But before eating, we started with a drink. I chose not to have the matching wines. Our waiter had a chat to me about what non-alchoholic drink he could make me. He asked about my preferences and we agreed he should surprise me. 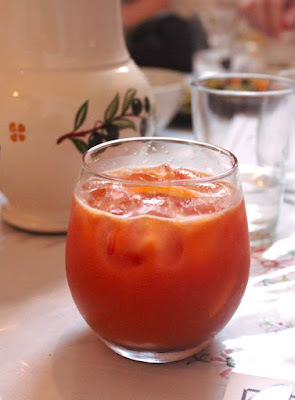 He served me a mandarin, orange and dark cherry drink that was so lovely and refreshing. 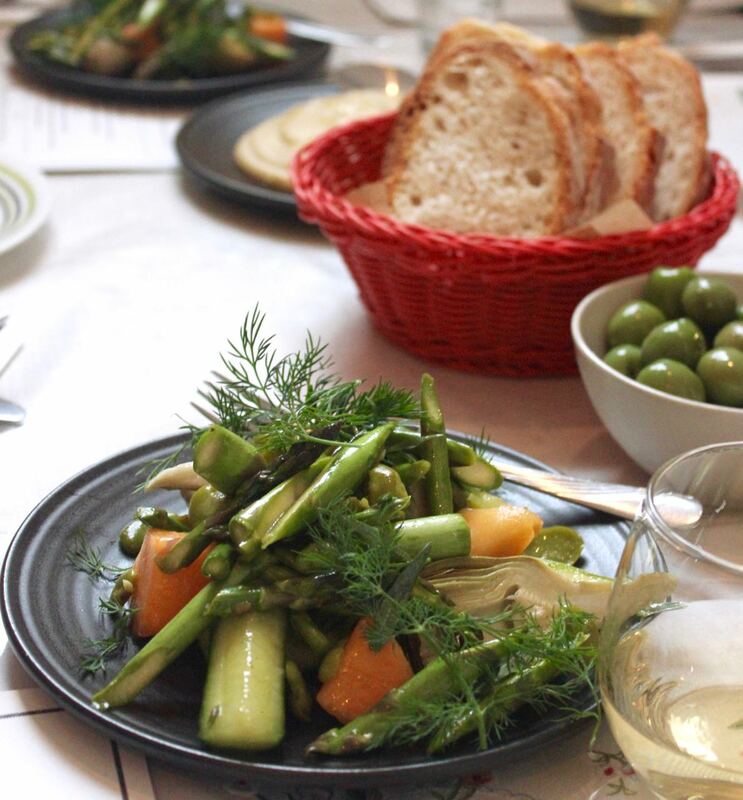 First up was the Verdura cunzati, which consisted of Sicilian green olives, warm maccu with olive oil and pane di casa, served alongside a pickled artichoke, asparagus, cucumber and melon. The maccu, a silky smooth broad bean dip, was amazing and I could have eaten a whole lot more with the soft and crusty bread. The olives were nice for nibbling as we chatted. I found the pickled vegetables a bit challenging as it is no something I am used to. They were cooked al dente and still retained some crunch. I liked it but didn't love it, especially as I could not build up enough enthusiasm to try the rock melon. 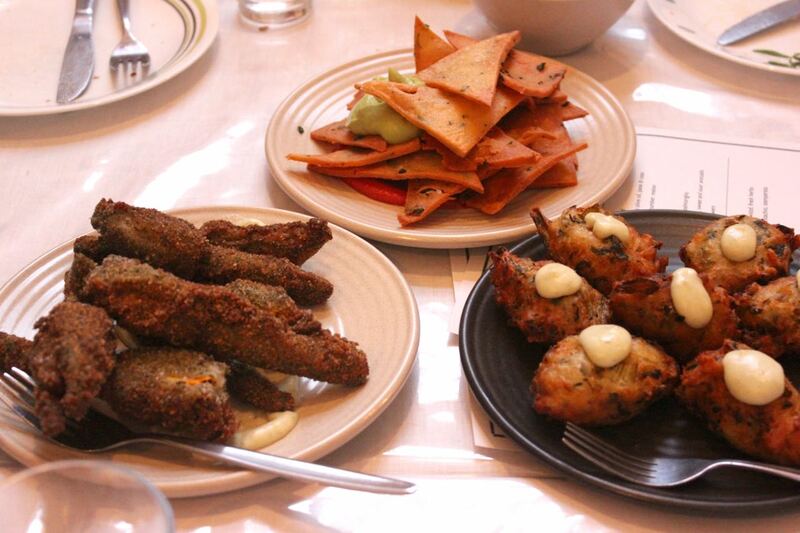 Three dishes arrived for the fritti course of fried street food. Zeppole of potato and chicory with salmoriglio; Chickpea panelle with tomato, chili and cumin salsa and sweet and sour avocado; and Herb-crusted zucchini flowers. The zeppole, or fritters, were lovely. These could well be Italian comfort food. Each had a dob of salmoriglio, which was an oil and lemon juice emulsion that was similar to mayonnaise. The fried zucchini flowers was surprisingly dark on the outside but upon biting in, the zucchini was a perfectly cooked bright green. The star of this course, however, was the chickpea panelle or chips. It was like a Sicilian nachos and executed beautifully. I was left wanting more of these crisp chips with the creamy avocado sauce and the lightly spiced salsa. For crudo, we were served raw dishes of Soused cauliflower with currants, pine nuts, witlof and fresh herbs; and Zucchini spaghetti with broad beans, mint, pistachio and stemperata. I confess to finding witlof a challenge and so I was wary of the cauliflower dish. It was nicely balanced with the currants and pinenuts but it was the mild flavoursome zucchini spaghetti that really called my name. This was one of my stand-out dishes of the night. 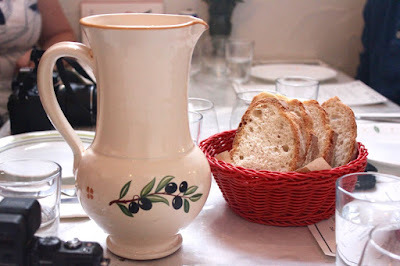 I did ask about the stemperata and remember capers and perhaps vinegar. Mint is not a flavour I associate with Italian food but it was brilliant here as were the broad beans. Next was arrosto, the roasted dishes, which consisted of Apunata of roasted baby vegetables with raspberry vincotto and Roasted eggplant and chickpeas with tomato passata. I was surprised that the passata was a little spicy. 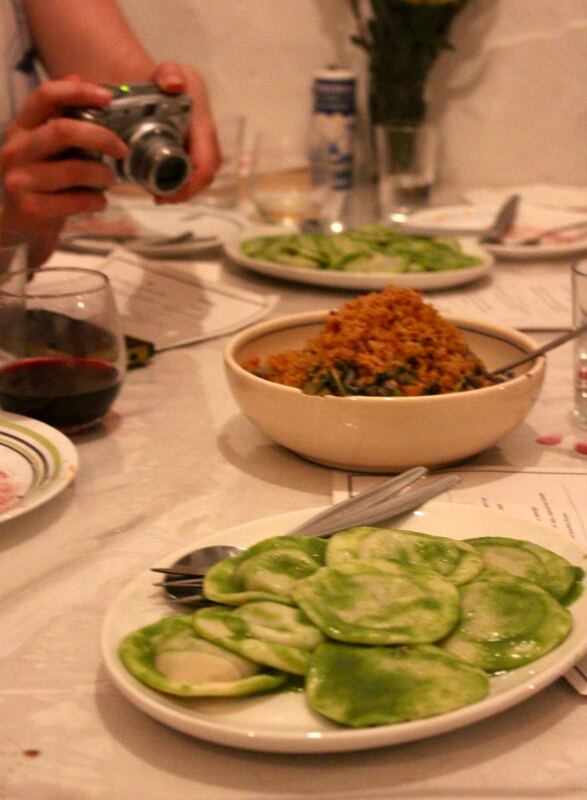 It was prettily presented and jazzed up the soft eggplant and chickpea mounds. I liked it but was even more impressed with the ruby coloured roast vegetables. At first I was concerned that the red vegie was chilli and I was happy to discover it was red capsicum among the beetroots, carrots and onion. It was the sort of side dish I love that was lightly seasoned enough not to blanket the vegetables and refreshing in its simplicity. I am not so familiar with Italian meal structure but I read that Secondi is the main course. And indeed the pasta e contorni dishes of Homemade ravioli of wild local vegetables, cannellini beans with salsa verde and olive oil and Warm lentils, garlic mollica and citrus were rather substantial. The dinner was great because it moved away from the starchy stereotypes of Italian cuisine: pasta, pizza and risotto. This was the only course with any of them. It was a treat to have home made pasta that was far more robust than dried pasta. It was toothsome with a filling that was quite soft and beany. The sauce was lovely but I could not quite identify the herbs in the salsa verde. Our waiter who had a genuine enthusiasm for the food told us that the lentils were a favourite dish of his. It was a great dish with lentils that were full of gentle flavour with a lovely crunch from the crisp breadcrumbs on top. Dessert comprised two dishes starting with a refreshing sorbetto. The spiced prune sorbet with Sicilian artisanal dark chocolate was light and fruity with just a touch of chocolate decadence. Lastly we were served the cuccia. According to the web "cuccia" means doghouse or dog basket. We regularly asked our waiter for translations of unfamiliar words and I wish we had sought an explanation of this one. Alas I can only tell you that our cuccia was an Almond milk, oat and farro pudding with bombolone, fresh berries and nut candy. We had a choice of espresso, camomile tea or bayleaf and lemon rind tea. I chose the latter. I was fairly full by now and not expecting much from a dessert that sounded like porridge. How wrong I was! 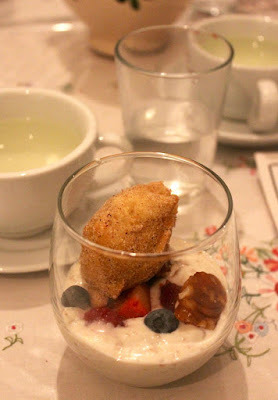 It was both creamy comfort food of the best kind and elevated to a fancy schmancy dessert by the juicy berries, jaw locking nut candy and soft fried slightly chewy bombolone or doughnut. I loved it. And I was grateful for the herbal tea alternatives which are not usually offered when coffee comes out with dessert. The bay leaf and lemon rind tea was just right with it. Then it was time to go home, once I had tried to paid the bill and been reminded I had already paid when booking. It had been a fantastic night of delicious food that challenged me to rethink the Italian cuisine; friendly discussion about family, vegan issues, Sammy J and Randy, and religion; and a great conviviality in the restaurant. 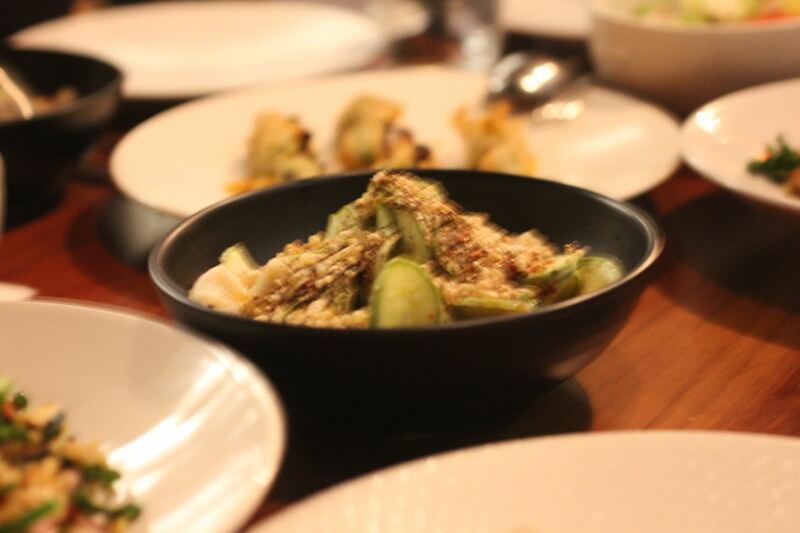 The regular Bar Idda menu has far less vegan meals though a few interesting vegetarian dishes. 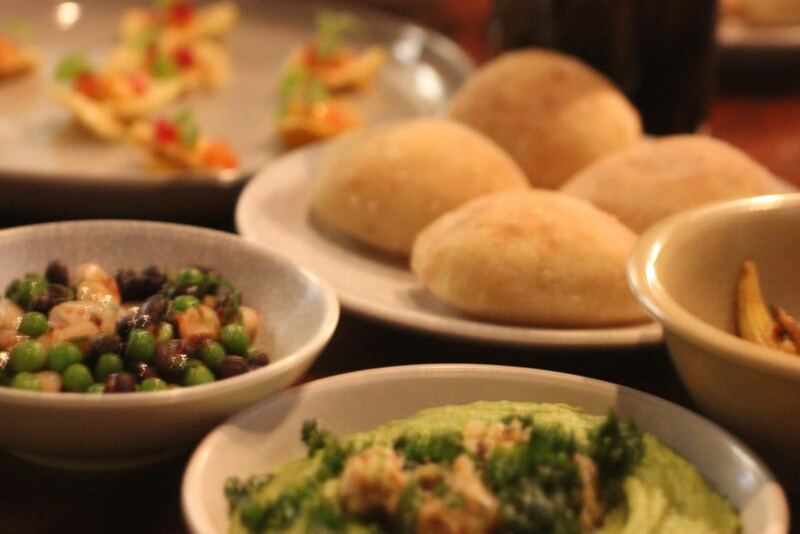 This dinner shows they can produce creative and delicious vegan food. I hope it might be indicative of the restaurant's willingness to accommodate dietary requirements but you would need to ring ahead and check on this. You can read more about the degustation and see some great photos on Veganopoulous. 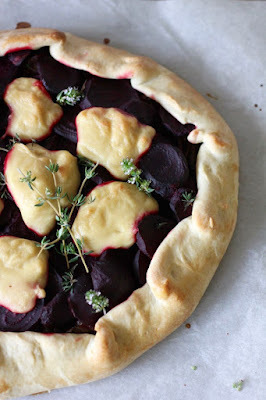 A few weeks ago I had a vision of a vegan galette complete with vegan mozzarella. It was a disaster of a night. The zucchini would not cook in the galette so I left it in for ages and ages. Then I made a chocolate pudding where I forgot to add baking powder. However, I loved the pastry and mozzarella. We ate well but I had to try the galette again. 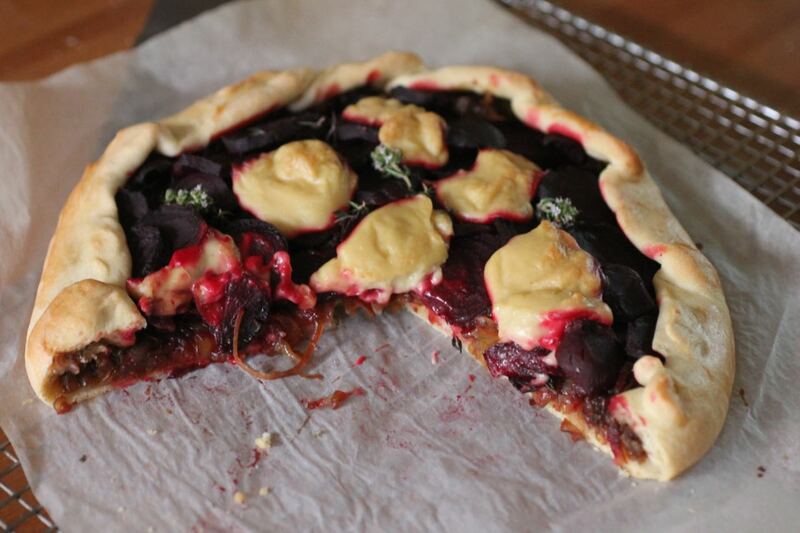 Next time I filled it with caramelised onion and beetroot and it was amazing. Good news - Crumpets with berry butter and caramelised almonds on the specials menu look amazing. Bad news - The pancakes Sylvia wanted are not available. Good news - I can get coconut bacon in my brunch. Bad news - They have forgotten our order and we are in a rush. Good news - We can order muffins and they are delicious. Bad news - They have forgotten our drinks and we have to gulp them down quickly. Good news - We don't have to pay. Bad news - I discover the movie starts at 12 not 12.15. Good news - We arrive in time and love watching the movie. Bad news - After the movie, we are still hungry after only eating a muffin for brunch. Good news - We have a voucher for two short stacks for the price of one at the Pancake Parlour. Bad news- I love short stacks (ie pancakes with maple syrup) but I really need savoury food. Bad news - I am tired when I get home. Great news - After a rest I make an excellent galette for dinner. 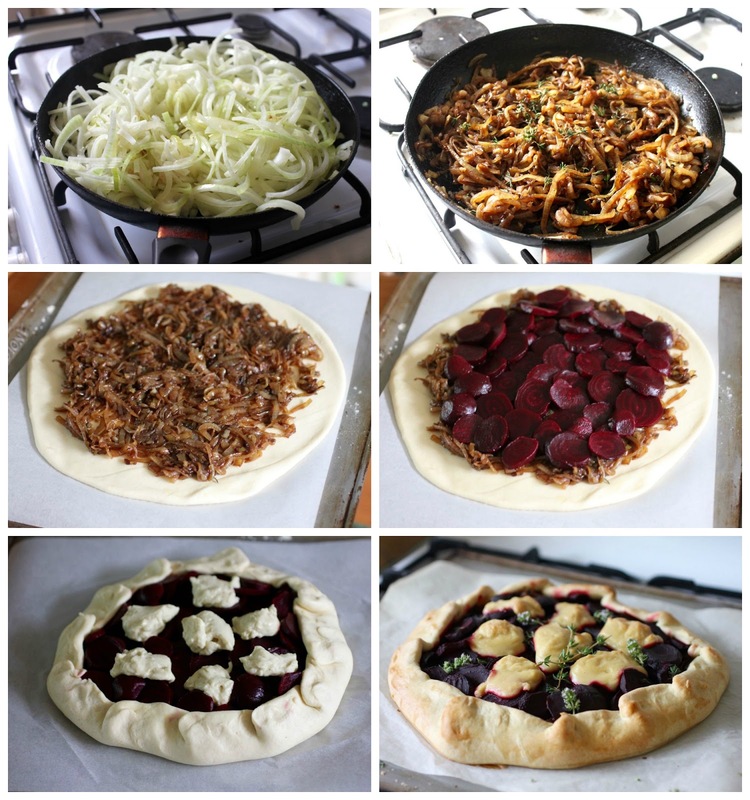 So, back to the galette. First let me tell you how amazing the pastry is. 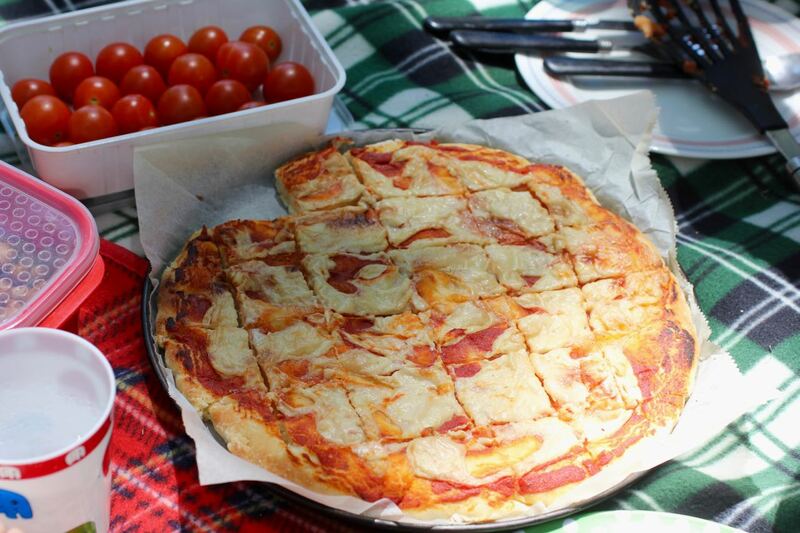 It comes from Joanne at Eats Well with Others who inspired the tomato galette. She uses butter and plain Greek yoghurt. A lot of butter. I used vegan margarine and vegan yoghurt the first time. The second time I used dairy yoghurt. Both were great. The pastry was really soft. In fact I worried it was too soft (I made it in two batches in my blender attachment for my hand held blender). But it came together when kneaded into a very soft dough. And once it had been in the fridge it was quite easy to roll out. 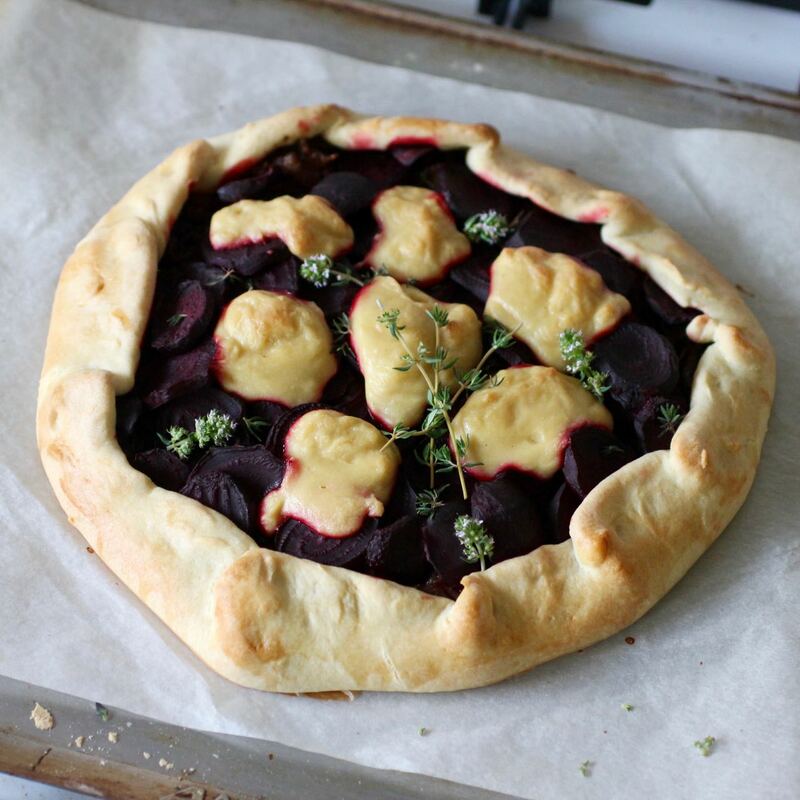 My inspiration for the filling came from discovering some precooked beetroot buried in the bottom of the fridge, remembering how well the caremlised onions worked in a goat cheese tart my mum recently made, and being impressed by the beetroot in a tart Shaheen recently made. I also had more vegan mozzarella to use up. While I felt that the first (tomato and zucchini) galette was cooked too long, I think I could have had the beetroot and caramelised onion in slightly longer. It was slightly undercooked in the middle but perfectly cooked on the outside. I also would have loved the mozzarella to crisp up a little more. I made a dairy cheese galette for Sylvia which cooked much faster, probably as it was smaller. I loved the mozzarella on top. Much of the flavour comes from the beetroot and onions so the mozzarella is optional but I loved it so much that I wanted more. I only had a small amount left. 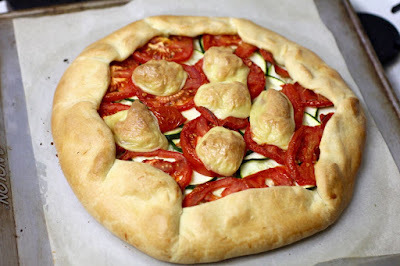 When I made the tomato and zucchini galette I had a whole batch of mozzarella and spread some on the base before adding the vegies to make the filling more creamy. Though the galette could have cooked slightly longer, I really really loved it. I had worried that the beetroot colour would bleed over the pastry and cheese but it didn't. The caramelised onions and beetroot were really lovely together. In fact I had to go back for seconds and couldn't wait til have more for lunch the next day. This galette is delicious warm or at room temperature. It would be great for a dinner party or a picnic. I hope to experiment with some different vegetable fillings. While I love beetroot, it is unforgiving if a piece falls on clothes or table cloths. I quite fancy a pumpkin filling next. 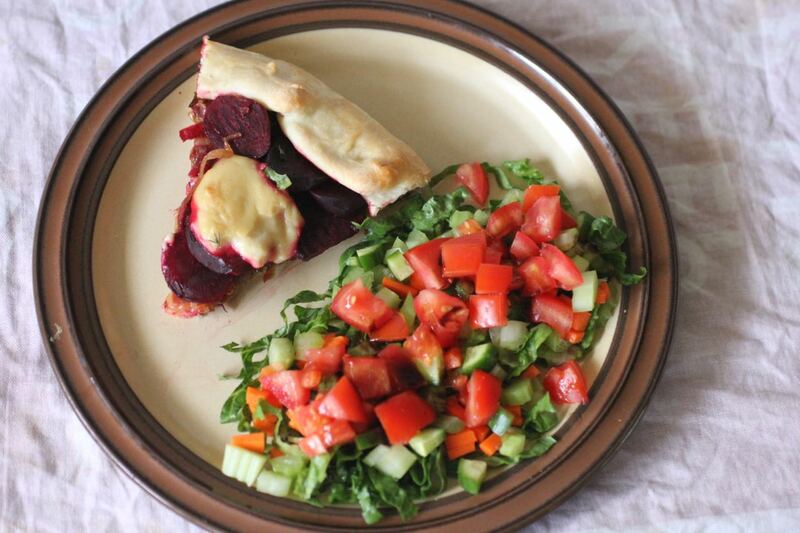 I am sending this galette to Kimmy at Healthy Vegan Fridays #73, Lisa and Jen for the Pastry Challenge, Ros and Caroline for Alphabakes (M for mozzarella), and Helen and Michelle for Extra Veg. First make pastry: Mix flour and salt in a food processor. Mix in butter until incorporated to make the mixture look like breadcrumbs. Mix in yoghurt, water and vinegar until it comes together into a soft mass. Turn out onto a lightly floured surface. Use a little extra flour to briefly knead until you have a smooth ball. 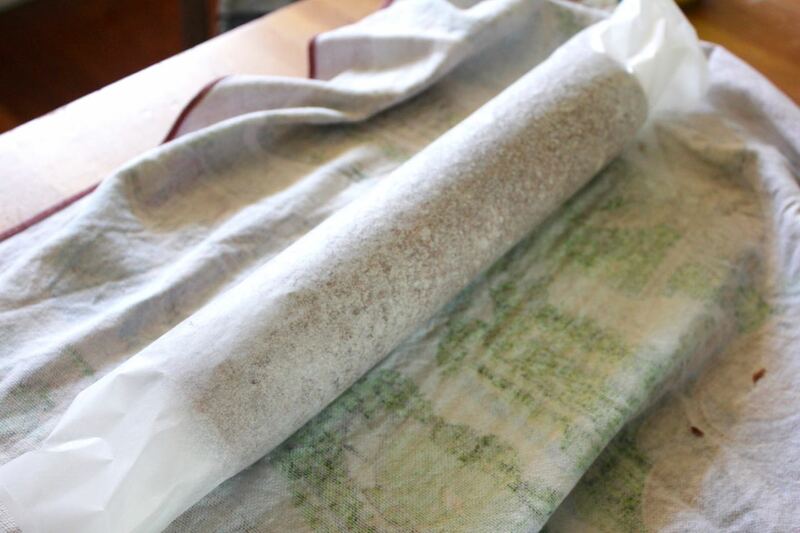 Wrap in clingwrap and refridgerate for at least 30 minutes. Preheat the oven to 200 C and line a large oven tray with baking paper. While the pastry chills, prepare the filling. Fry the onions in oil for about 30 minutes over medium heat until soft and sweet. Turn off heat and stir in balsamic vinegar, thyme and salt and pepper. Roll out the pastry to about 1/2 cm thickness on the baking paper on the oven tray. [I only uused 3/4 of the pastry - see NOTES - but I think it would be fine to use all of it if your tray is big enough.] Use a little flour for the rolling pin. Spread the fried onions onto the base leaved about 3-5cm around the edges. Next arrange the sliced beetroot over the onion. Drop blobs of vegan mozzarella over the beetroot. Fold the edges of pastry over the filling, making tucks as you go so the pastry sits neatly. It is to be rustic so it does not need to be perfect. Brush pastry edges with soy milk. Bake for 30-40 minutes until the pastry is golden brown and the mozzarella is slightly brown. Serve warm or at room temperature. Keeps in the fridge overnight. NOTES: The mozzarella is optional or other cheeses could be used on top such as brie or cheddar. But it is substantial enough without cheese. If I had more mozzarella I would try using more. I made the pastry vegan by using vegan margarine and vegan (coconut) yoghurt. It worked really well this way. 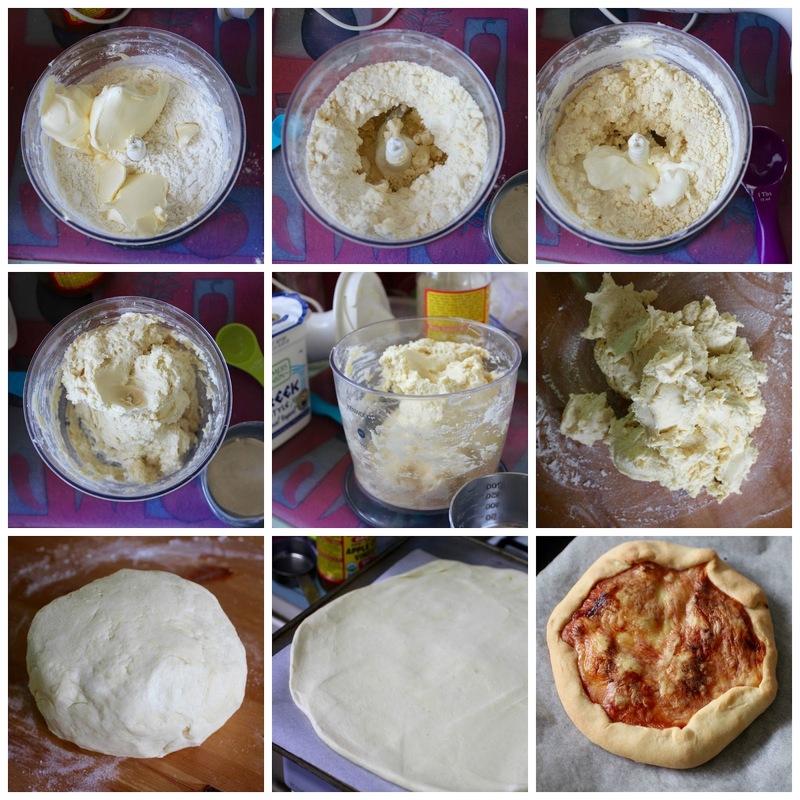 I used about 3/4 of the pastry for the galette because I used some for a plainer pizza sauce and cheese galette for my daughter. I think there is enough filling to make a larger galette with all the pastry or even two smaller ones. As I found it easier to make two batches of pastry in the bowl attachment to my hand held processor I have noted the halved amounts of pastry for when I make this again.